XtreemOS is a grid operating system based on Linux. The main particularity of XtreemOS is that it provides for Grids what a traditional operating system offers for a single computer: hardware transparency and secure resource sharing between different users. It thus simplifies the work of users by giving them the illusion of using a traditional computer while removing the burden of complex resource management issues of a typical Grid environment. When a user runs an application on XtreemOS, the operating system automatically finds all resources necessary for the execution, configures user’s credentials on the selected resources and starts the application. Learn more about XtreemOS here, or watch the video below. Try XtreemOS right now in the open testbed. Download the last stable version. Watch some featured applications running with XtreemOS. This video is an introduction to the capabilities of XtreemOS, presented by some key XtreemOS members. The XtreemOS Project gathers 19 partners from Europe and China, from academic and industrial backgrounds. 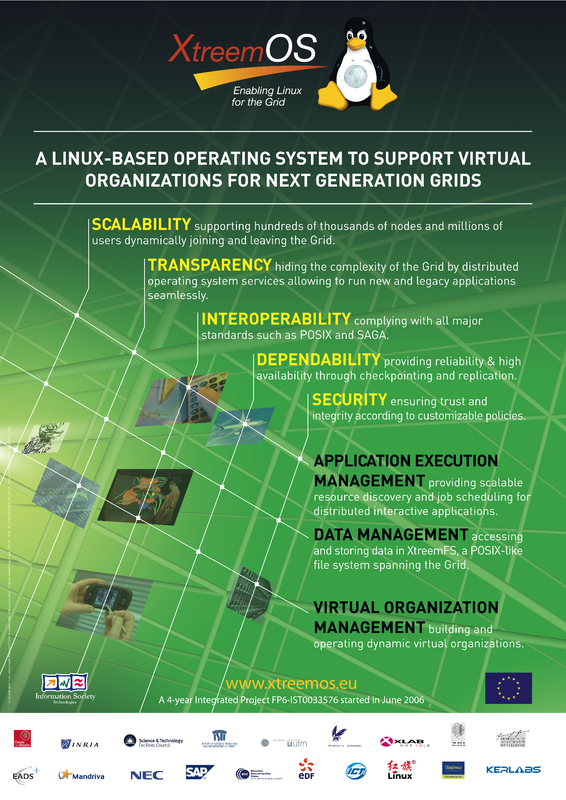 The main objective of the XtreemOS project is to design and develop the XtreemOS grid operating system. XtreemOS is a silver organizational member of the OGF community. XtreemOS is funded by the European Commission through the Information Society Technology under contract IST-FP6-033576. Learn more about the XtreemOS Project. The goal of the Contrail project is to design, implement , evaluate and promote an open source system in which resources that belong to different operators are integrated into a single homogeneous Fedarted Cloud that users can access seamlessly. Contrail will vertically integrate an open source disitrbuted operating system for autonomous resource management in Infrastructure-as-a Service environments, and high level services and runtime environments as foundations for Platform-as-a-Service. Contrail will leverage the open source XtreemOS system, which was designed for large scale dynamic infrastructures. XtreemOS is also experimented with Nimbus and Open Nebula.